Between eating, visiting, and playing games, I worked on one knitting project at my nephew's house on Christmas. 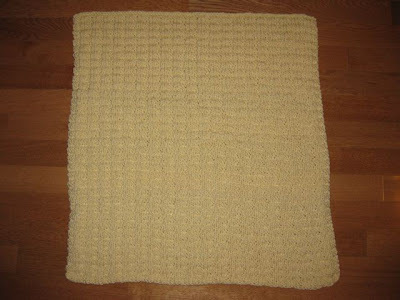 I finished the 30-inch square baby blanket on Sunday evening and delivered on Monday morning. 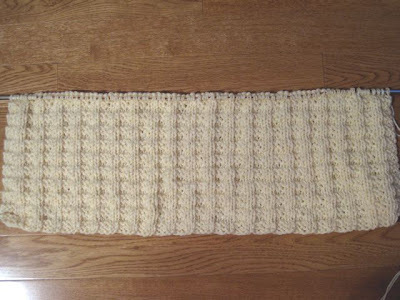 The pattern, a simple four-row repeat and easy to memorize, allowed me to visit and knit. 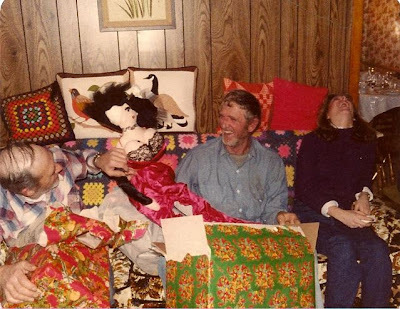 Christmas morning always brought gifts and surprises, and none was more memorable than the gift my brother, Rich opened in 1986. Note the reaction of my nephew's wife, seated on the right. No one took credit for the gift, so the guessing began. My sister, Marilyn was the culprit. 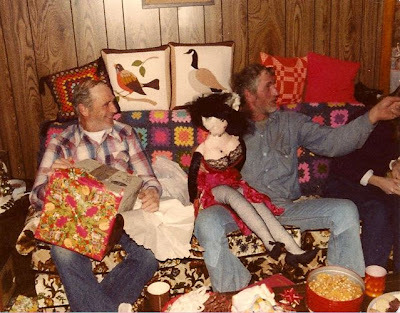 The doll resided in Rich's game room for many years. Growing up on a dairy farm, I learned at an early age that no matter how special the day chores came first. Always. Christmas was no exception. Gifts could not be opened until the milking was finished, the cows fed, and the barn cleaned. It was so hard to wait until everyone came in from finishing their chores. Of course, if Santa left some gifts unwrapped, then they could be touched, but everything else was off limits. The photo above was taken in the milking barn during the summer of 1973. It shows my brother (Rich), my nephew (Larry), and my mother (Rosa). All of the grandkids spent summers on the farm and learned to milk, drive tractors, and work in the fields. It was a way for them to stay busy and to make some money. I had just graduated from college when this photo was taken. My sister, Evelyn took this photo of my mother on Christmas day 1987. Mom was 74 years old and still working in the barn every morning and night. 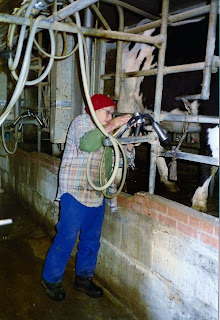 She dressed in layers and cut the right arm of her shirts short so it would not get wet when she cleaned the cow's udders. Evelyn worked in the barn whenever she came to visit. It allowed her to spend more time with Mom. Everyone in the family calls her Sis. I didn't even know her real name until I was about 10 years old. "Evelyn" still feels foreign on my tongue: she will always be "Sis" to me. 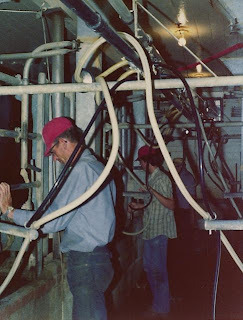 My family operated the dairy over forty-five years. It started in a small barn with two stanchions. The milk was collected in big stainless steel buckets that had to be carried to the bulk tank and emptied. A new barn was built in the 1960s with six stanchions and a glass pipeline that carried the milk directly to the bulk tank. Milking was faster and easier but still an awful lot of work, especially on sub-zero days. There was always coffee in a thermos in the barn and treats, too because Mom and Rich ate their breakfast in the barn while milking. Mom worked on word search puzzles or read quilting magazines and Rich took cat naps while the vacuum machine milked the cows. 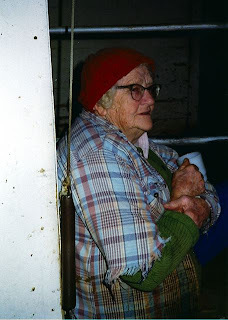 I treasure this "portrait" of my mother, sitting at the end of the barn, drinking a cup of coffee. I hear the rhythm of the compressors, the soft clink of the cow's neck tags against the feed bin as they eat ground oats, and the muffled songs coming from the radio in the adjoining room. It was imperative to develop patience "when chores came first." For the Christmas Eve meal, my family always served Oyster Stew. I didn't care for the oysters when I was young, but I liked having a bowl without any oysters in it. Gradually, I came to love the oysters, too. 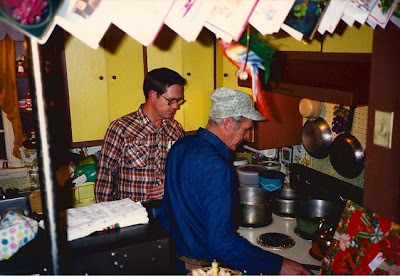 This photo from 1986 shows Paul, my brother-in-law, and John, my oldest brother, preparing the stew. John had the procedure down to a science. Notice the cards hanging above. Mom used to hang her cards on this opening and on the archway into the living room. I still prepare and serve Oyster Stew for Christmas Eve. Does your family have a traditional meal on Christmas Eve? My mother loved Christmas and always made it a magical time. She spent hours placing individual icicles on each branch. Sometimes the trees were really scrawny, so my brother drilled holes in the tree and then "grafted" branches from the bottom. 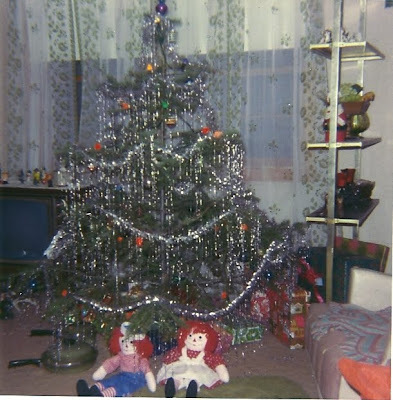 This tree (circa 1971) was one of the last "real" trees she decorated. My sister, Marilyn made the Raggedy Andy and Ann dolls for Mom. The Club Aluminum cookware was new that year and was finally "retired" in the 90s. My mother wrote the recipe for Sally Ann's on the end flap of her favorite cookbook. Nothing about this cookie is fancy, but for my sister and me nothing beats a Sally Ann and a cup of tea or coffee at Christmas. Marilyn sent an email last week reminding me to make Sally Ann's. (As if I needed a reminder.) Yesterday I prepared the dough and baked them this morning. Mom never spoke of a Sally Ann, and no one in the extended family is even named Sally. Several years ago I asked my Uncle Oscar if he remembered his mother making Sally Ann's. He smiled and said that he did, so obviously the recipe is very old. Oddly, even though they contain two cups of sugar, the cookies are not overly sweet. Cream softened butter/margarine. shortening, and sugars. Add eggs. Stir in all dry ingredients a little at a time. Dough will be stiff. I always use my hands when it gets to this stage. Add walnuts (I put 1 1/2 c. in the cookies I make) and work evenly into the dough. Form dough into two rolls/logs about 2 or 2 1/2 inches thick. Roll the logs in waxed paper and place in refrigerator overnight. Preheat the oven to 400 degrees. Remove the wax paper and slice the dough in 1/8 inch to 1/4 inch sections. (I prefer the thicker slices). The dough slices easier if it is firm, so do not allow the logs to set on the counter too long before slicing. Place the slices on a cookie sheet and and leave space for the cookies to expand. Lightly sprinkle sugar (white or colored) on the tops. Bake 8 - 10 minutes. I don't like them very dark or hard, so I take mine out after 8 minutes. 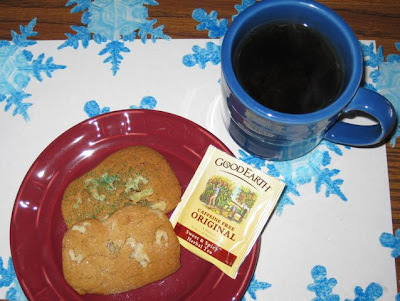 On a side note: if you like tea, try Good Earth's Sweet & Spicy. It tastes a bit like good ole' Southern Sweet Tea without the added sugar. It complements the Sally Ann's perfectly. My sister and her husband are on the way, so it's time to change the sheets, go grocery shopping, bake a batch of cookies, and do some dusting. In order to spend more time with family, I am scheduling posts for the rest of the week. I'll see you after Christmas. One of the hospital employees asked me to knit a blanket for a grandchild. The yarn is from my stash - Caron Simply Soft in a soft ivory, called Fisherman. It is knit, double-stranded, on size 13 needles. 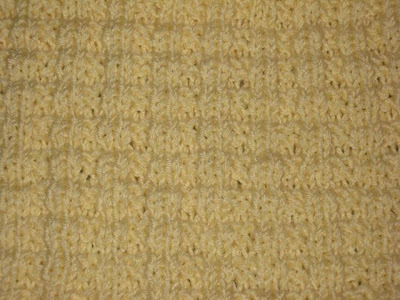 The pattern is #EBB09 designed by JoAnne Turcotte and published in the 8-Hour Baby Blanket book, Plymouth Yarn, 2007. The book price ranges from $5 to $8, so look around for a good price. Two skeins of yarn (3 ounces each) created nearly 10 inches. I am pleased with the pattern and the look of the blanket. My nephew's wife wants a hat, scarf, and mitten set. She purchased the yarn and the pattern and intended to knit it herself. However, she determined that she could not understand the pattern and asked if I would make it for her. 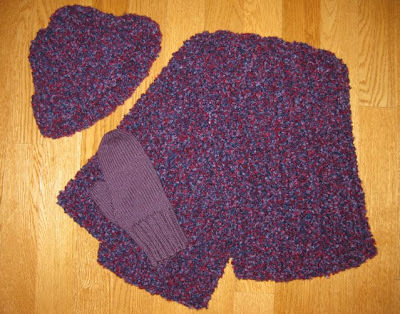 The pattern calls for double-stranded, bulky yarn and knit on size 15 and 10.5 needles. She purchased a boucle yarn. Once I started knitting the hat, I knew the yarn was going to give me problems: it was nearly impossible to see the stitches and sometimes one of the strands would slip. I breathed a sigh of relief once I finished the 72-inch scarf. Earlier, I determined that I would not even attempt to make the mittens with the boucle. I found a dark purple acrylic yarn in my stash that matches the boucle very well. The red in the boucle doesn't allow the solid mitten to photograph correctly, but trust me it is a very close match. The second mitten will not take long, completing Katie's winter set. Jen, a PH friend, sent me the cute ornament with the red bird as part of an ornament exchange with individuals on the PHA Message Board. It fits comfortably with all of the other ornaments. My tree is filled with memories of my childhood (see the doll-sized mirror) and of my friends (the snowflake on the left) and of trips that I've taken (the snowflake on the right). It is also covered with glass icicles which seem to twinkle when the colored light hits them just right. One of the "ornaments" on my tree is a wishbone from the 1977 Christmas turkey. 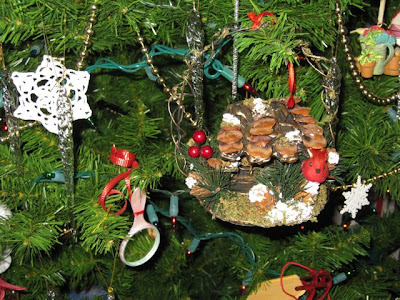 What is the oddest ornament on your tree? 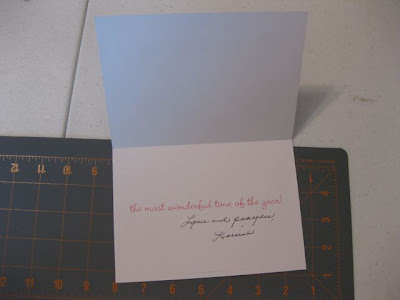 I love sending and receiving greeting cards, and I enjoy giving them another opportunity to spread their cheer. 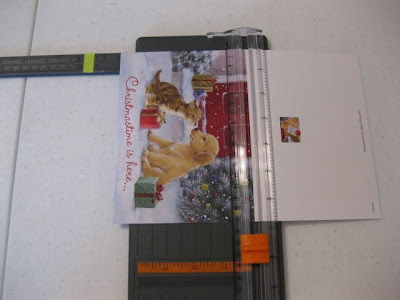 Here is how you can up-cycle your holiday greeting cards into postcards. The bonus is that the postage for postcards is 28 cents! 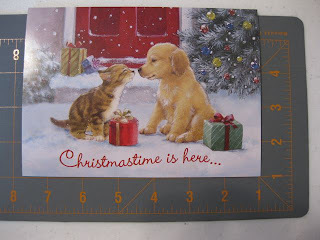 First, make sure that the card is an appropriate size. The U.S. 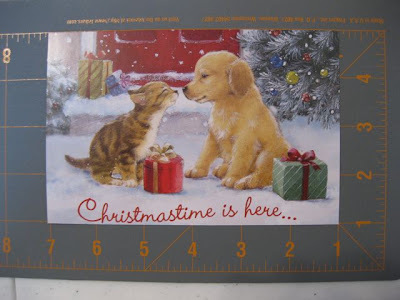 Postal Service has specific requirements for postcards: minimum size 3.5 inches high and 5 inches long or maximum size 4.25 inches high and 6 inches long. Any other sizes will result in additional postage. Second, make sure the other side does not have any writing on it. I also do not use the cards that have an embossed image as it makes it difficult to write on them. 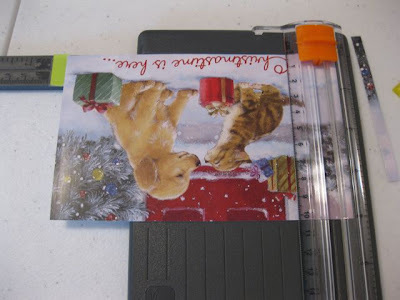 I use a small portable paper cutter to trim the card, but you could easily use scissors. Center the design on the card as you do the trimming. Check for the proper size and trim more, if necessary. 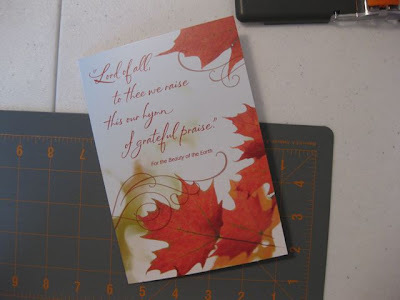 Any card can be salvaged, so don't overlook other holidays and occasions. 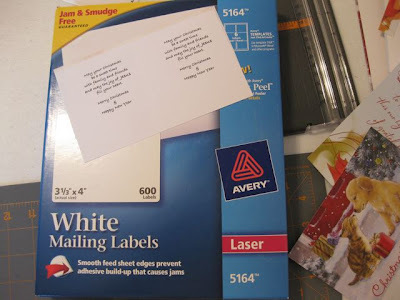 Of course you can simply write on the postcard, but I like to print a greeting on peel-and-stick shipping labels. By changing the font size to a small but legible size, you can even write the typical family letter. If you have cards that are too small for the postal requirements, don't throw them away. These make great gift tags or gift enclosures. 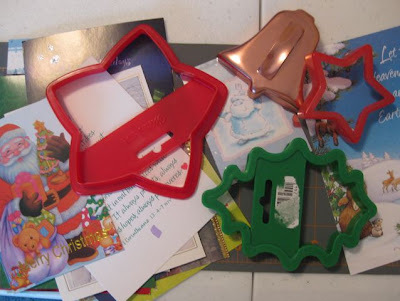 You can even make fun shapes by using your cookie cutters for patterns. This project is great for saving money and saving the environment. I use coil-less safety pins all the time when I knit. They make handy markers to help me judge distances and how much longer a piece needs to be. They are moveable motivators that help me to see just how much I knit in one sitting, especially helpful when the project is large and seemingly without an end. 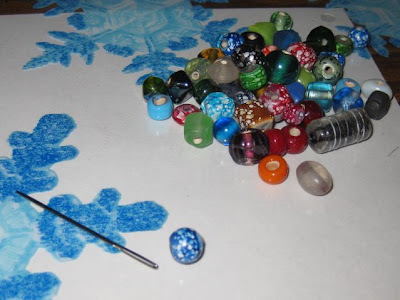 But I discovered when I combine the pins with numbered or alphabet beads that they become even more useful. 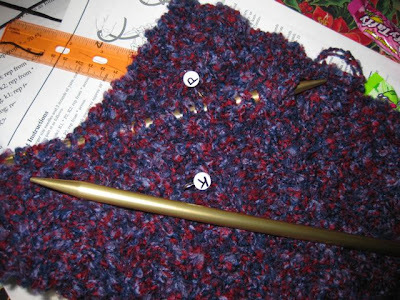 I am working on ribbed scarf for my nephew's wife, who purchased the yarn and selected the pattern. The yarn is a bulky boucle, and not the most pleasant yarn with which to knit. It is difficult to see the stitches, so I am using the coil-less safety pin with a "K" on the side that begins with a "knit" stitch, and a "P" on the side that begins with a "purl" stitch. I can see at a glance rather getting frustrated from searching. 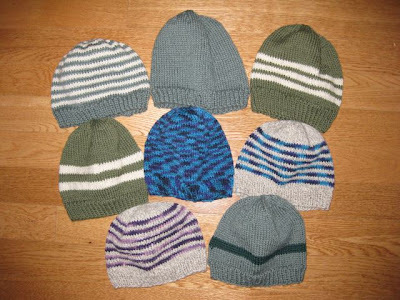 One of the ladies in my knitting group works at a school, and last week she asked the group to knit some hats. In cold weather, the teachers do not allow the students to go outside for recess unless they can prove they have a good coat, gloves, and a hat. Many of the children did not have hats. It is difficult for elementary children to be inside all day. Now, at least eight will have the chance to go outside and run off some energy. Check with schools in your area to see if they need some hats. A quick note to answer a question: I use my postal scale a lot. I weigh a finished item to see how much I need and then find close to that amount in my scrap bag, but even so, I've come close to running out of yarn for a scrap-yarn project. The striped hat in the upper left is a prime example. 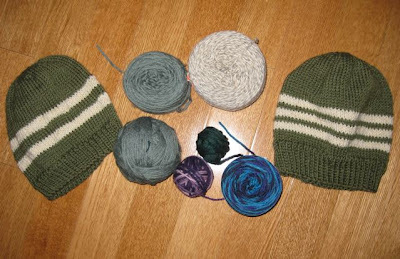 I knew I would not have enough of the green to finish in the same color combination, so the top of the hat, I knit three or four rows of white and one one row of green. It is not that noticeable unless you really look at it. Other times, I just grab another color and make the item even more colorful. Last week's cold weather was a true blessing in disguise. Wednesday night I grabbed a frozen dinner from the deep freeze in the garage, and when my hand brushed against a loaf of bread that was soft, I knew I had a problem. Since the electrical breaker and outlet were fine, it was obvious the chest freezer had died. 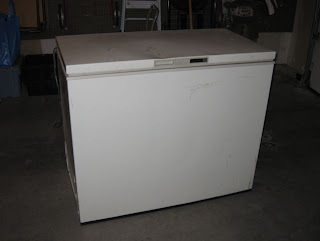 I wasn't really surprised because the freezer was over 29 years old: it had been faithful for nearly 10,602 days. I worried that the contents of the entire freezer would have to be discarded. I tossed thawed vegetables and pizza, fruit and soups from the top of the freezer, but the meat at the bottom was still frozen solid. I put some of the packages of beef in my side-by-side in the house and the rest in a plastic garbage can. 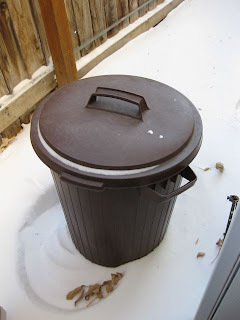 I set the can outside the garage door where the sub-zero and frigid temperatures would keep the contents from thawing until I could find a replacement freezer. By Thursday evening the meat was back in the garage safely tucked in the new freezer. Hopefully, this one will serve me as faithfully as the old one. I was fortunate the old freezer died in the winter when I had a natural alternative for keeping the meat frozen. I am fortunate that I was home and discovered the problem. Do you have an extra freezer? Have you checked it lately? I admit it - I am an idealist with images of how the world should be and delusions that all people are honest. I received a statement in the mail several months ago for Creative Knitting. I like the magazine and promptly sent in payment without any question. Fast forward to yesterday when a statement arrived for Knit Simple. I checked my list of magazines and discovered that I had already renewed it for two years, but nothing on the statement reflected the expiration date. The company on the invoice IS legitimate. They are NOT scammers, but in my opinion, their marketing practices are not very ethical. The payment I sent in response to the other statement (from the same billing company) did indeed renew my subscription. However, by paying the invoice, I unknowingly extended my subscription to 2014. It makes me wonder how this company got my address and my subscription information? Moral: Don't take every "statement" or "invoice" at face value. 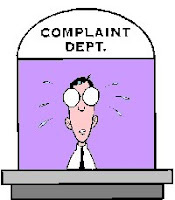 Check directly with the business online rather than call the number on the invoice. Be alert. Scoundrels are everywhere ready to take advantage of the idealist in all of us. Need some gifts in a hurry? 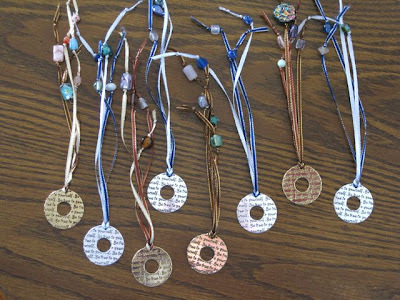 Make some bookmarks out of flat pendants, ribbon, and beads. I found the flat pendants in the clearance section at Michaels (75% off of the previous markdown price), so I got two pendants for less than a dollar. Even the ribbon (1/8 inch wide) was on sale. 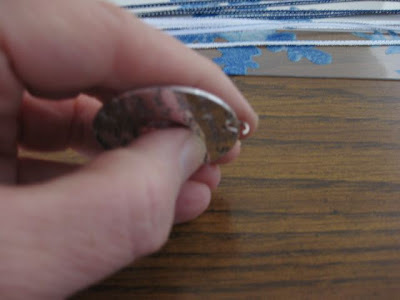 Begin by removing the ring at the top of the pendant. Cut the ribbon into 12 - 14 inch lengths and fold in half. (I used two different ribbons.) 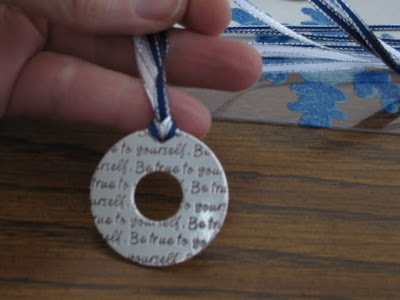 Carefully insert the folded ribbon through the hole in the pendent. I preferred threading it from back to front, but you may decide to go front to back. 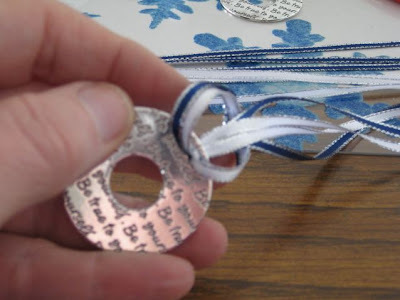 Insert the tails of the ribbon through the loop, you created. Tighten the ribbon and adjust, if necessary. 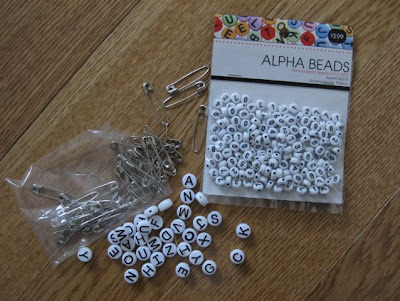 Now you will need some beads or charms. I had some remaining from the stitch markers I made last year. 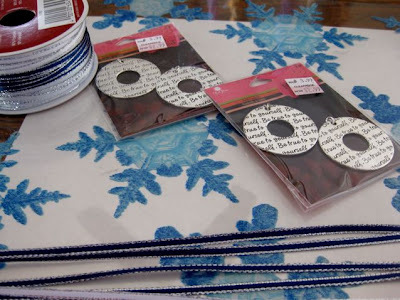 Make sure the beads have large holes to allow the ribbon to be threaded through them. I found a small tapestry needle handy for coaxing the thread through. 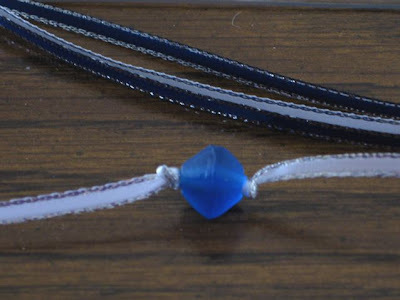 Tie a knot at both ends of the bead. 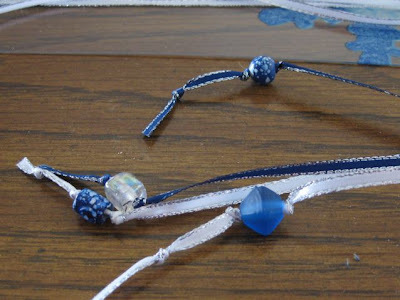 Remember this is a bookmark, so make sure you don't tie the beads too close to the pendant. I also tied a knot near the end of the ribbon. These eight bookmarks cost a total of $8.58 or $1.07 each. If I had purchased the materials at full price, I would have spent $22.98 or $2.87 each.